Easy guitar songs that are as beautiful and well-known as The Water is Wide are true treasures. Download these free printable easy guitar songs for yourself or your students. This is one of those pieces of folk sheet music that it seems everyone I know sang in high school! 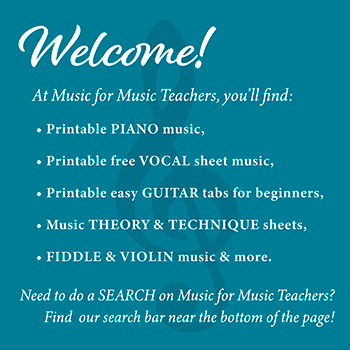 Scroll down the page for the links to the free PDF sheets. One arrangement we sang employed an echo effect, like this: "The water is wide (the water is wide), I cannot get o'er (I cannot get o'er)..." This is very pretty and not too hard. Something I like to do with my guitar students when reading the tablature is to hunt for all the eighth notes, by looking in the staff above. When we spot the "fast" notes, we take a pen or pencil and "hook" the tab notes beneath together to make them look like the eighth notes in the staff. The Dsus (D suspended) and Asus (A suspended) chords are interesting and beautiful -- quite unlike other beginner chords -- and it is usually in this song that my guitar students are first exposed to them. I tell my students that the basic root of the chord is still there, plus one finger added that will lift off when the chord "resolves" into the root chord. That's why you see one string with two fingers on it: just build a regular D or A chord, then add your pinky (finger 4 for guitarists) to add the sound of "suspense." The longer this chord is held, the longer the listener is waiting with expectation for the beauty of the resolution into the regular chord. I own two great folk song books that include this song, except the name given in both of the books is "O Waly, Waly." Both books, Folk Songs by William Cole ("Folk Songs of England, Ireland, Scotland & Wales" edited by William Cole with music arrangements by Norman Nomath), and One Hundred English Folksongs by Cecil Sharp, have 8 verses of lyrics, of which 3 verses are almost identical to the lyrics I have used here. The book by William Cole is especially handy, because it has simple piano accompaniments, and chord symbols for guitarists, giving you lots of easy guitar songs! The book edited by Cecil Sharp has some wonderful songs in it, but no chord symbols, and the piano accompaniments tend toward being a bit heavy, even difficult, and maybe somewhat "Romantic" in flavor. Not so suitable for playing along with a fiddle, for example. If you have never sung or played this English folk song before, get ready for a treat for yourself and your students. A little secret: GIRLS LOVE THIS SONG! The Water is Wide: Christmas words!